I have spent some of my time knitting a very special project for the Sight is Life Initiative. This Initiative is to raise money to help to provide eye care for the people of The Congo, one of the poorest countries in the world. I was amazingly flattered to be asked to join a group of designers to each design a pattern for the e-book (available through Ravelry). The first pattern has already been released and my contribution will be available from 5th July. Bright Tomorrow is a crescent shaped shawl, worked from the top down, with all over lace, a beaded lace panel and border and is worked in three colours though there is no reason why you could not work it in one colour or more than three. 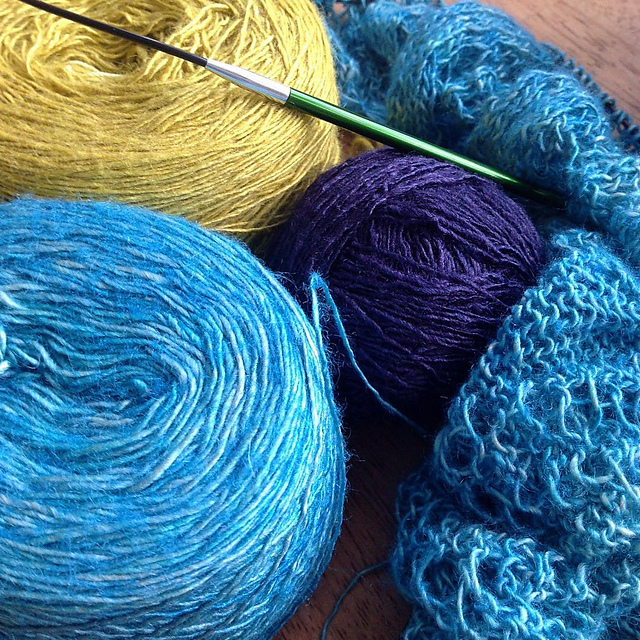 The original was worked in Dye for Yarn Tussah Silk Lace - perfect for summer knitting and a brilliant cause. Here is a sneak peek at my shawl as a work in progress. Watch this space for the grand unveiling! Bev that's wonderful. I'm looking forward to seeing this. I've already bought the e-book. It's a great cause to support. It really is a fantastic cause! The girls at DyeForYarn are on board too and will be dyeing up some amazing colours throughout July. We will be having a KAL in the Boo Group too so we would love you to join us! Thank you so much! It is a brilliant cause and they are doing tremendous work.